^ Census in Brief: The Aboriginal languages of First Nations people, Métis and Inuit. www12.statcan.gc.ca. [2017-11-12] （英语）. ^ Hammarström, Harald; Forkel, Robert; Haspelmath, Martin; Bank, Sebastian (编). Eastern Canadian Inuktitut. Glottolog 2.7. Jena: Max Planck Institute for the Science of Human History. 2016. Mallon, Mick. Inuktitut Linguistics for Technocrats. Inuktitutcomputing.ca. Mallon, Mick. Introductory Inuktitut. 1991. ISBN 0-7717-0230-2. Mallon, Mick. Introductory Inuktitut Reference Grammar. ISBN 0-7717-0235-3. Spalding, Alex. Inuktitut: a Grammar of North Baffin Dialects. 1992. ISBN 0-920063-43-8. 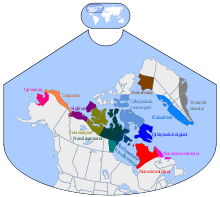 The Inuktitut Language. Project Naming | the identification of Inuit portrayed in photographic collections at Library and Archives Canada. Collectionscanada.ca. （原始内容存档于2006-10-28）. Arctic Languages: An Awakening (PDF). (2.68 MB), ed: Dirmid R. F. Collis. ISBN 92-3-102661-5. Although as many of the examples as possible are novel or extracted from Inuktitut texts, some of the examples in this article are drawn from Introductory Inuktitut and Inuktitut Linguistics for Technocrats. Balt, Peter. Inuktitut Affixes. Rankin Inlet? N.W.T. : s.n, 1978. Fortescue, Michael, Steven Jacobson, and Lawrence Kaplan. Comparative Eskimo Dictionary with Aleut Cognates – second edition. Fairbanks: University of Alaska Press, 2011. ISBN 1555001092. Kalmar, Ivan. Case and Context in Inuktitut (Eskimo). Mercury series. Ottawa: National Museums of Canada, 1979. Schneider, Lucien. Ulirnaisigutiit An Inuktitut–English Dictionary of Northern Québec, Labrador, and Eastern Arctic Dialects (with an English-Inuktitut Index). Québec: Les Presses de l'Université Laval, 1985.